You may have spotted this old window from the Home Tour I posted a few days ago. I found the window at an antique store here in Parker for less than $30. (Score. ) I had to clean it up a bit but it was in pretty good shape when I bought it. I had seen signs going around blog land that had a similar message. So I came up with ones that were most relevant to our family, got out my silhouette, created the words with white vinyl, and slapped them on the window. The sign above is simply made from a 2 x 4 and some paint we had in our garage. I love this old window and its message. It is probably my favorite piece in our whole house. I purposely hung it in a place where we pass by and see it multiple times a day. It is a great symbol of what our family is about, big or small. 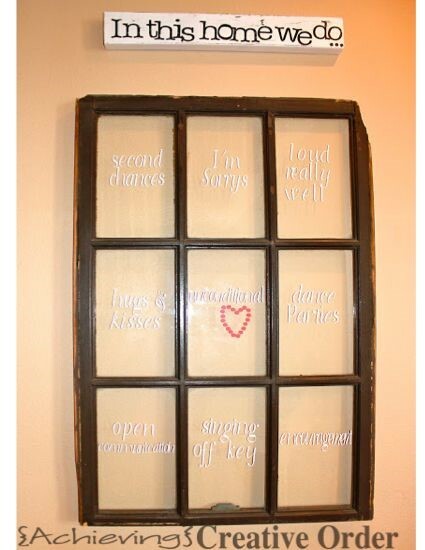 The window sort of represents our house while each phrase is what you can see looking in. It is a great reminder of what is really important to us as a family.